Back in June, Equinor made the bold and exciting decision to release all its data from the decommissioned Volve oil field in the North Sea. Although the intent of the release seemed clear, the dataset did not carry a license of any kind. Since you cannot use unlicensed content without permission, this was a problem. I wrote about this at the time. To its credit, Equinor listened to the concerns from me and others, and considered its options. Sensibly, it chose an off-the-shelf license. It announced its decision a few days ago, and the dataset now carries a Creative Commons Attribution-NonCommercial-ShareAlike license. Unfortunately, this license is not ‘open’ by any reasonable definition. The non-commercial stipulation means that a lot of people, perhaps most people, will not be able to legally use the data (which is why non-commercial licenses are not open licenses). And the ShareAlike part means that we’re in for some interesting discussion about what derived products are, because any work based on Volve will have to carry the CC BY-NC-SA license too. NC licenses are incompatible with CC-BY-SA. This means that the data cannot be used on Wikipedia, SEG Wiki, or AAPG Wiki, or in any openly licensed work carrying that license. NC-licensed data cannot be used commercially. This is obvious, but far-reaching. It means, for example, that nobody can use the data in a course or event for which they charge a fee. It means nobody can use the data as a demo or training data in commercial software. It means nobody can use the data in a book that they sell. The boundaries of the license are unclear. It's arguable whether any business can use the data for any purpose at all, because many of the boundaries of the scope have not been tested legally. What about a course run by AAPG or SEG? What about a private university? What about a government, if it stands to realize monetary gain from, say, a land sale? All of these uses would be illiegal, because it’s the use that matters, not the commercial status of the user. Now, it seems likely, given the language around the release, that Equinor will not sue people for most of these use cases. They may even say this. Goodness knows, we have enough nudge-nudge-wink-wink agreements like that already in the world of subsurface data. But these arrangements just shift the onus onto the end use and, as we’ve seen with GSI, things can change and one day you wake up with lawsuits. Creative Commons licenses are, as the name suggests, intended for works of creativity. Indeed, the whole concept of copyright, depends on creativity: copyright protects works of creative expression. If there’s no creativity, there’s no basis for copyright. So for example, a gamma-ray log is unlikely to be copyrightable, but seismic data is (follow the GSI link above to find out why). Non-copyrightable works are not covered by Creative Commons licenses. What’s a ‘derivative work’? It’s anything ‘based upon’ the licensed material, which is pretty vague and therefore all-encompassing. In short, if you use or show Volve data in your work, no matter how non-commercial it is, then you must attach a CC BY-NC-SA license to your work. This is why SA licenses are sometimes called ‘viral’. By the way, the much-loved F3 and Penobscot datasets also carry the ShareAlike clause, so any work (e.g. a scientific paper) that uses them is open-access and carries the CC BY-SA license, whether the author of that work likes it or not. I’m pretty sure no-one in academic publishing knows this. My impression is that Equinor is trying to satisfy some business partner or legal edge case, but they are forgetting that they have orders of magnitude more capacity to deal with edge cases than the potential users of the dataset do. The principle at work here should be “Don’t solve problems you don’t have”. Encumbering this amazing dataset with such tight restrictions effectively kills it. It more or less guarantees it cannot have the impact I assume they were looking for. I hope they reconsider their options. The best choice for any open data is CC-BY. There’s a saying in programming: untested code is broken code. Is unreproducible science broken science? I hope not, because geophysical research is — in general — not reproducible. In other words, we have no way of checking the results. Some of it, hopefully not a lot of it, could be broken. We have no way of knowing. Next week, at the SEG Annual Meeting, we plan to change that. Well, start changing it… it’s going to take a while to get to all of it. For now we’ll be content with starting. We’re going to make geophysical research reproducible again! Welcome to the Repro Zoo! 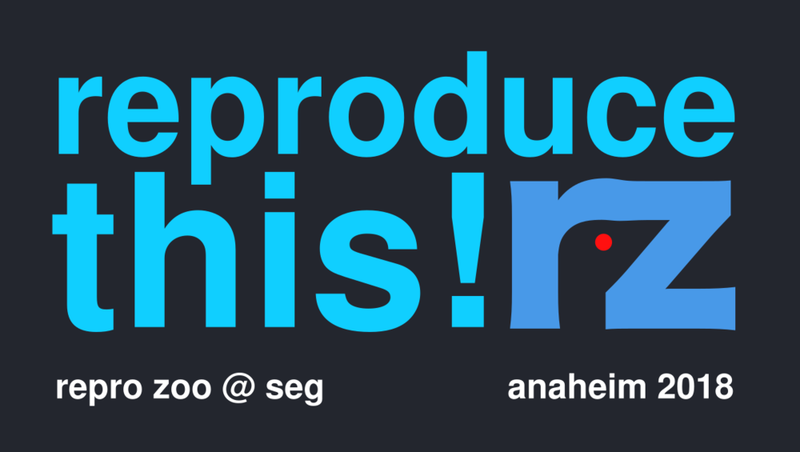 If you’re coming to SEG in Anaheim next week, you are hereby invited to join us in Exposition Hall A, Booth #749. We’ll be finding papers and figures to reproduce, equations to implement, and data tables to digitize. We’ll be hunting down datasets, recreating plots, and dissecting derivations. All of it will be done in the open, and all the results will be public and free for the community to use. Vote on the papers and figures to reproduce, or propose new ones. Click here! Show up at Booth #749 to take part. Bring your laptop, or use one of ours (kindly provided by Dell EMC, our amazing booth neighbours). We’ll mostly be coding in Python and Julia, but any open language is welcome. Tell people about the Repro Zoo and bring them along too. That’s all there is to it! Whether you’re a coder or an interpreter, whether you have half an hour or half a day, come along to the Repro Zoo and we’ll get you started. Figure 1 from Connolly’s classic paper on elastic impedance. This is the kind of thing we’ll be reproducing. Have you been looking for an excuse to find out what machine learning is all about? Or maybe learn a bit of Python programming language? If so, you need to check out Brendon Hall's tutorial in the October issue of The Leading Edge. Entitled, "Facies classification using machine learning", it's a walk-through of a basic statistical learning workflow, applied to a small dataset from the Hugoton gas field in Kansas, USA. But it was also the launch of a strictly fun contest to see who can get the best prediction from the available data. The rules are spelled out in ther contest's README, but in a nutshell, you can use any reproducible workflow you like in Python, R, Julia or Lua, and you must disclose the complete workflow. The idea is that contestants can learn from each other. Left: crossplots and histograms of wireline log data, coloured by facies — the idea is to highlight possible data issues, such as highly correlated features. Right: true facies (left) and predicted facies (right) in a validation plot. See the rest of the paper for details. The task at hand is to predict sedimentological facies from well logs. Such log-derived facies are sometimes called e-facies. This is a familiar task to many development geoscientists, and there are many, many ways to go about it. In the article, Brendon trains a support vector machine to discriminate between facies. It does a fair job, but the accuracy of the result is less than 50%. The challenge of the contest is to do better. As you can see, DNNs (deep neural networks) are, in keeping with the amazing recent advances in the problem-solving capability of this technology, doing very well on this task. Of the 'shallow' methods, random forests are quite prominent, and indeed are a great first-stop for classification problems as they tend to do quite well with little tuning. There is still over 6 weeks to enter: you have until 31 January. There is a little overhead — you need to learn a bit about git and GitHub, there's some programming, and of course machine learning is a massive field to get up to speed on — but don't be discouraged. The very first entry was from Bryan Page, a self-described non-programmer who dusted off some basic skills to improve on Brendon's notebook. But you can run the notebook right here in mybinder.org (if it's up today — it's been a bit flaky lately) and a play around with a few parameters yourself. The contest aspect is definitely low-key. There's no money on the line — just a goody bag of fun prizes and a shedload of kudos that will surely get the winners into some awesome geophysics parties. My hope is that it will encourage you (yes, you) to have fun playing with data and code, trying to do that magical thing: predict geology from geophysical data. There's a new book in the 52 Things family! 52 Things You Should Know About Rock Physics is out today, and available for purchase at Amazon.com. It will appear in their European stores in the next day or two, and in Canada... well, soon. If you can't wait for that, you can buy the book immediately direct from the printer by following this link. Ludmilla Adam, Why echoes fade. Arthur Cheng, How to catch a shear wave. Paul Johnson, The astonishing case of non-linear elasticity. Chris Skelt, Five questions to ask the petrophysicist. It's our best collection of essays yet. We're very proud of the authors and the collection they've created. It stretches from childhood stories to linear algebra, and from the microscope to seismic data. There's no technical book like it. Purchasing the book will not only bring you profund insights into rock physics — there's more! Every sale sends $2 to Geoscientists Without Borders, the SEG charity that supports the humanitarian application of geoscience in places that need it. Read more about their important work. It's been an extra big effort to get this book out. The project was completely derailed in 2015, as we — like everyone else — struggled with some existential questions. But we jumped back into it earlier this year, and Kara (the managing editor, and my wife) worked her magic. She loves working with the authors on proofs and so on, but she doesn't want to see any more equations for a while. If you choose to buy the book, I hope you enjoy it. If you enjoy it, I hope you share it. If you want to share it with a lot of people, get in touch — we can help. Like the other books, the content is open access — so you are free to share and re-use it as you wish. What's this? Two posts about the legal intricacies of copyright in the space of a fortnight? Before you unsubscribe from this definitely-not-a-law-blog, please read on because the case of Oracle America, Inc vs Google, Inc is no ordinary copyright fight. For a start, the damages sought by Oracle in this case [edit: could] exceed $9 billion. And if they win, all hell is going to break loose. The case is interesting for some other reasons besides the money and the hell breaking loose thing. I'm mostly interested in it because it's about open source software. Specifically, it's about Android, Google's open source mobile operating system. The claim is that the developers of Android copied 37 application programming interfaces, or APIs, from the Java software environment that Sun released in 1995 and Oracle acquired in its $7.4 billion acquisition of Sun in 2010. There were also claims that they copied specific code, not just the interface the code presents to the user, but it's the API bit that's interesting. You might think of software in terms of applications like the browser you're reading this in, or the seismic interpretation package you use. But this is just one, very high-level, type of software. Other, much lower-level software runs your microwave. Developers use software to build software; these middle levels contain FORTRAN libraries for tasks like signal processing, tools for making windows and menus appear, and still others for drawing, or checking spelling, or drawing shapes. You can think of an API like a user interface for programmers. Where the user interface in a desktop application might have menus and dialog boxes, the interface for a library has classes and methods — pieces of code that hold data or perform tasks. A good API can be a pleasure to use. A bad API can make grown programmers cry. Or at least make them write a new library. The Android developers didn't think the Java API was bad. In fact, they loved it. They tried to license it from Sun in 2007 and, when Sun was bought by Oracle, from Oracle. When this didn't work out, they locked themselves in a 'cleanroom' and wrote a runtime environment called Dalvik. It implemented the same API as the Java Virtual Machine, but with new code. The question is: does Oracle own the interface — the method names and syntaxes? Are APIs copyrightable? I thought this case ended years ago? The original 2012 holding that Google did not violate the copyright Act by copying 37 of Java's interfaces. Click for the full PDF. The problem with all this is that, when it come to open source software and the Internet, APIs make the world go round. As the Electronic Frontier Foundation argued on behalf of 77 computer scientists (including Alan Kay, Vint Cerf, Hal Abelson, Ray Kurzweil, Guido van Rossum, and Peter Norvig, ) in its amicus brief for the Supreme Court... we need uncopyrightable interfaces to get computers to cooperate. This is what drove the personal computer explosion of the 1980s, the Internet explosion of the 1990s, and the cloud computing explosion of the 2000s, and most people seem to think those were awesome. The current bot explosion also depends on APIs, but the jury is out (lol) on how awesome that one is. The trial continues. Google concluded its case yesterday, and Oracle called its first witness, co-CEO Safra Catz. "We did not buy Sun to file this lawsuit," she said. Reassuring, but if they win there's going to be a lot of that going around. A lot. ADDENDUM on 26 May 2016... Google won the case with the "fair use" argument. So the appeal court's decision that APIs are copyrightable stands, but the jury were persuaded that this particular instance qualified as fair use. Oracle will appeal. Seismic company GSI has sued a lot of organizations recently for sharing its copyrighted seismic data, undermining its business. A recent court decision found that seismic data is indeed copyrightable, but Canadian petroleum regulations can override the copyright. This allows data to be disclosed by the regulator and copied by others — made public, effectively. ...the creation of field and processed [seismic] data requires the exercise of sufficient skill and judgment of the seismic crew and processors to satisfy the requirements of [copyrightability]. What is required to attract copyright protection in the expression of an idea is an exercise of skill and judgment. By skill, I mean the use of one’s knowledge, developed aptitude or practised ability in producing the work. By judgment, I mean the use of one’s capacity for discernment or ability to form an opinion or evaluation by comparing different possible options in producing the work. There exist no cases expressly deciding whether Seismic Data is copyrightable under the American Copyright Act [in the US]. I agree that the rocks at the bottom of the sea are not copyrightable. It's really worth reading through some of the ruling, especially sections 7 and 8, entitled Ideas and facts are not protected and Trivial and purely mechanical respectively. This recent ruling about seismic data was the result of an action brought by Geophysical Service Incorporated against pretty much anyone they could accuse of infringing their rights in their offshore seismic data, by sharing it or copying it in some way. Specifically, the claim was that data they had been required to submit to regulators like the C-NLOPB and the C-NSOPB was improperly shared, undermining its business of shooting seismic data on spec. You may not have heard of GSI, but the company has a rich history as a technical and business innovator. The company was the precursor to Texas Instruments, a huge player in the early development of computing hardware — seismic processing was the 'big data' of its time. GSI still owns the largest offshore seismic dataset in Canada. Recently, however, the company seems to have focused entirely on litigation. Nalcor Energy – Oil and Gas Inc.
Why did people share the data? The intent is quite clear: the regulators are entitled to the stacked, migrated data. The full list is worth reading, it covers a large amount of data. If this is enforced, it is not very rigorous. If these datasets ever make it into the hands of the regulators, and I doubt it ever all does, then it's still subject to the haphazard data management practices that this industry has ubiquitously adopted. Nonetheless, I agree with the Defendants that [Section 101] read in its entirety does not make sense unless it is interpreted to mean that permission to disclose without consent after the expiry of the 5 year period [...] must include the ability to copy the information. In effect, permission to access and copy the information is part of the right to disclose. So this is the heart of the matter: the seismic data was owned and copyrighted by GSI, but the regulations specify that seismic data must be submitted to regulators, and that they can disclose that data to others. There's obvious conflict between these ideas, so which one prevails? Where two provisions are in conflict and one of them deals specifically with the matter in question while the other is of more general application, the conflict may be avoided by applying the specific provision to the exclusion of the more general one. The specific prevails over the more general: it does not matter which was enacted first. Parliament was aware of the commercial value of seismic data and attempted to take this into consideration in its legislative drafting. The considerations balanced in this regard are the same as those found in the Copyright Act, i.e. the rights of the creator versus the rights of the public to access data. To the extent that GSI feels that this policy is misplaced, its rights are political ones – it is not for this Court to change the intent of Parliament, unfair as it may be to GSI’s interests. So that's it: the data was copyright, but the regulations override the copyright, effectively. The regulations were legal, and — while GSI might find the result unfair — it must operate under them. The decision must be another step towards the end of this ugly matter. Maybe it's the end. I'm sure those (non-lawyers) involved can't wait for it to be over. I hope GSI finds a way back to its technical core and becomes a great company again. And I hope the regulators find ways to better live up to the fundamental idea behind releasing data in the first place: that the availability of the data to the public should promote better science and better decisions for Canada's offshore. As things stand today, the whole issue of 'public subsurface data' in Canada is, frankly, a mess.